Parenting advice is everywhere. Everyone seems to have their opinions on the correct, appropriate, right way to parent. And, through the few years of my parenting, I've relied on a lot of this information to get through the day. Some of the advice is good. Some of it isn't. Because of this, I've compiled my own list of advice that I wish someone had told me. 1. 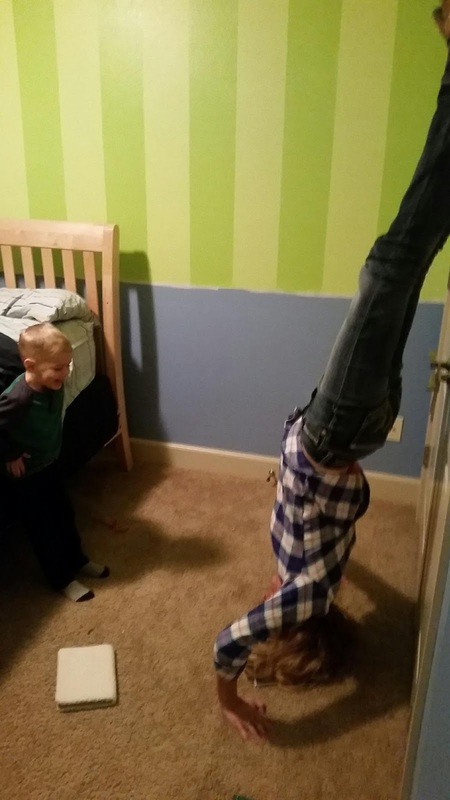 Only give your children directions when standing on your head. This way your kids may actually pay attention to you. Do you have the same problem that your children don't listen to you? Mine don't. I've tried saying it quietly, getting down at their level, giving them incentives to complete the directions, drawing diagrams, having bonuses available for completing the directions...I may have even given directions at a volume which could be heard two states over. But, no matter the manner in which I give directions, I have to remember that my kids are still just kids. They are going to get distracted, throw temper tantrums because they want to do anything else, or they just won't be able to remember/do what I've asked of them. Yes, there will be times they actually accomplish the task assigned to them...but that task was probably given by someone other than me, their mom. 2. Don't make or buy food for your kids. No, make and buy it for yourself - it's the only way you'll always get your kids to eat the food in front of them because they automatically think that the food in front of you is really for them. You can try making them kid-friendly food and, yes, sometimes they will eat it without your prodding, begging, and pleading. Yet, my kids never fail to want the food that is on my plate. It's become such an issue at times that I will actually prepare myself two plates of food because I know that the first will be eaten by my kids. I never would have known that my kids LOVE calamari if I hadn't first ordered it and attempted to eat it myself. 3. Only give birth on a Tuesday morning. Ok, let's face it. There are WAY too many pieces of advice about birthing children. But, when it all comes down to it, it's one of the hardest feats that a woman has to endure. It doesn't matter if it's with or without drugs; in a hospital, birthing center, or out in the middle of the woods; with a midwife, doctor, or your entire extended family in attendance...and so much more. You are bringing a child - or children - into this world. Yes, there are things that may make it easier, less painful, less risky...but it is still bringing a child into this world. Whether you push it out a tiny hole that really should not expand to that size or if you need to have it surgically removed...IT'S BIRTHING A CHILD! 4. Don't expect that your child will be exceptional. Know that your child already is exceptional. No matter the circumstances surrounding your child, they have been wonderfully made. A child doesn't have to grow up to be a rocket scientist, neurosurgeon or President to be noteworthy. They are already remarkable. 5. Kids will be kids. Ok, so this is one piece of advice you probably already hear, but I'm not sure it's fully and completely understood. Your child/children will break things - expensive things. They will destroy things. They will hit, scream, pull hair, throw things, cut their own hair (or someone else's), cut the pet's hair, color your walls/furniture/their own face/a sibling's body with marker. They will climb everything and then jump off of it. They will make messes. They will say inappropriate things - at inappropriate times. They won't always follow a schedule. They will get sick on days you need them to be well. They will get mad for no reason then, five minutes later, tell you how much they love you. They won't sleep until you need them to be awake. They'll make silly faces when you want them to smile. They won't sit still. They will act like monsters...otherwise known as kids. Being a parent often times means feeling like you aren't doing enough. But, you are. You are being a parent. It's not easy, but you're doing it. Take the advice that you deem worthy for your own situation. Ignore the rest. Or, fake it till you make it. Isn't that what all of us really are doing? Maybe that's why it doesn't matter the advice you're being given in the latest scientific study or award-winning book. You'll always find another study, book, or person who can counter it.